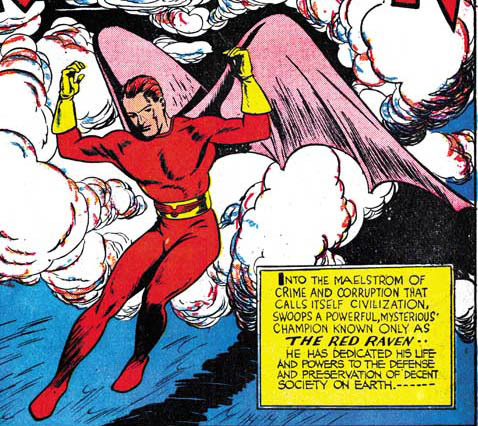 Powers/Abilities: The Red Raven's costume uses anti-gravity technology to allow him to fly, with wings on the costume used to control said flight. He is somewhat stronger and fitter than normal humans, due to the rarified atmosphere he grew up in. In the modern era, his wings gained the ability to fire bolts of energy. History: (Red Raven #1, ga) The Bird People were a hidden race who lived on a flying island above the Pacific. When a plane crash left a human orphan in their midst, his parents dead in the wreck, the Bird People raised the child as one of their own, even creating artificial wings for him to make up for his lack of natural ones. Known by his adopted people as Red Raven, when he reached adulthood the King of the Bird People told him "With the aid of the wings we made you, you shall go back to your people and devote your life to eradicating the elements that make for unhappiness in their world." He returned to the war-torn world outside, where he soon adopted the role of a hero, battling a villain named Zeelmo. (Marvel Premiere #29, Invaders I #6, Marvel Premiere #30, Invaders I #7) The Red Raven joined several fellow heroes in forming the Liberty Legion, first to free the brainwashed hero group the Invaders, and then, having decided to stay together, to defend the American homefront against Fifth Columnists. (Marvel Two-in-One Annual #1, Marvel Two-in-One #20) The Liberty Legion teamed up with the Thing, a time-travelling hero from the future, and battled several Nazi villains attacking New York. (Invaders I #35-38) The Liberty Legion joined the Invaders in battling the armoured German superhuman Iron Cross. (Fantastic Four I#405(fb), X-Men #44, Sub-Mariner I #26, Nova III #4, 5, 7, Captain Marvel V #16, 20, 21, Defenders II #6,7, Order #2-6) After the war, the Red Raven returned home. The Bird People decided to guarantee their own safety by making the world believe they had been wiped out, fooling the X-Men and the Sub-Mariner to perpetuate this story. Now the King of the Bird People, the Red Raven continues to live on their flying island. Comments: Created by Joe Simon and Louis Cazenueve. 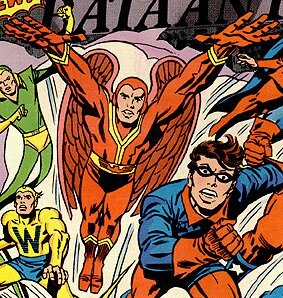 It was revealed during the "modern age" that the Bird People were an offshoot of the Inhumans who had split from the rest of their race.